Finding myself as an artist: 100th post!!!! I am all over the place with my sewing lately. I am still working on my antique linen Free motion Quilting. Just a few pebbles and piano keys to be done. I think it might become a pillow. Once again, I was cursed with Pinterest and had to try something new. I was searching for an idea for my May pincushion exchange and saw an easy way to do cathedral window blocks. I could not just stop at only one as you can see. 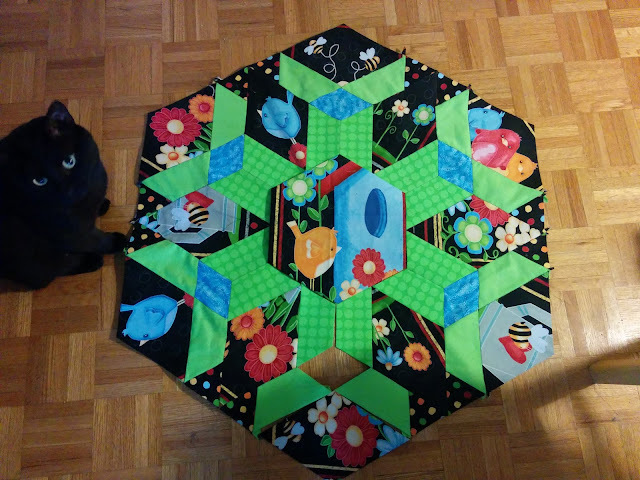 My EPP mystery quilt is almost done!!! We had the last clue and we were able to solve it. Very happy with the results and I have to decide how to finish it. I think it would make a nice wall hanging but Frenko the cat think it should be his bed. and finally.....my NEW DESK!!!! Before I was working on the kitchen table and it was a mess. 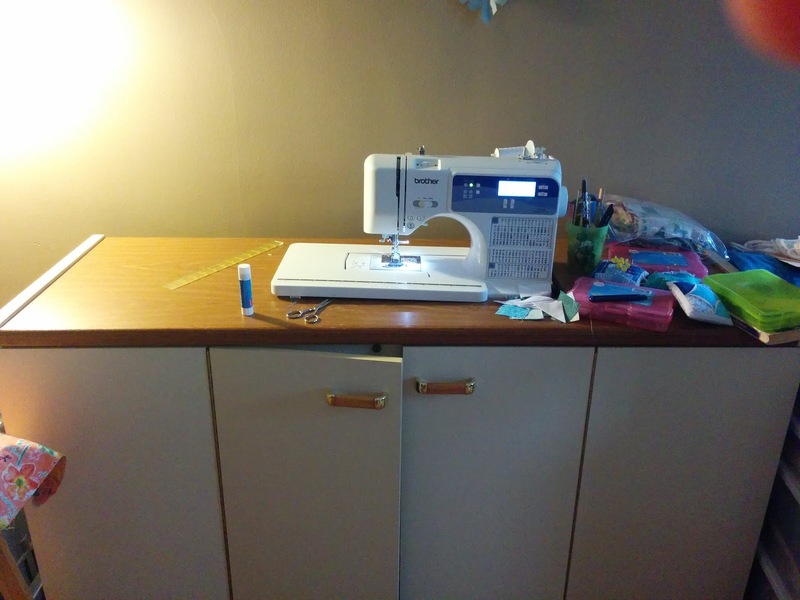 We saw this table on Kijiji and my Sweet Boyfriend was able to get it for a very good price! Thank you my love. It's a mess like usual....but it is a mess that make me happy. Happy 100th post. Love all your creativity and sharing. Great new desk/sewing table. Doesn't look messy to me at all. Wish mine looked as organized as yours. Congrats on 100 posts! You have some really pretty projects going on and now a great workspace to work on them. Thanks for linking up with Oh Scrap! Congratulations on you 100th post. Your work is phenomenal. Congratulations on your blogging milestone. The EPP design is great! 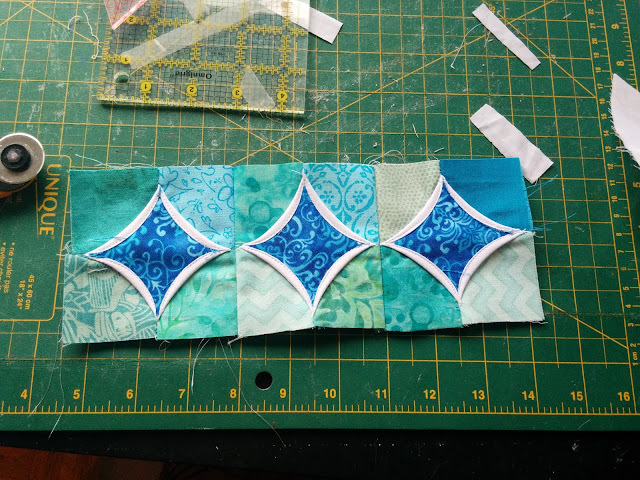 Love your EPP mystery project! Yea for 100 posts! When first looking it never dawned on me that your piece was epp. It is fabulous. I think the more modern fabric makes it sing! I love that FMQ piece, it will make a beautiful pillow. 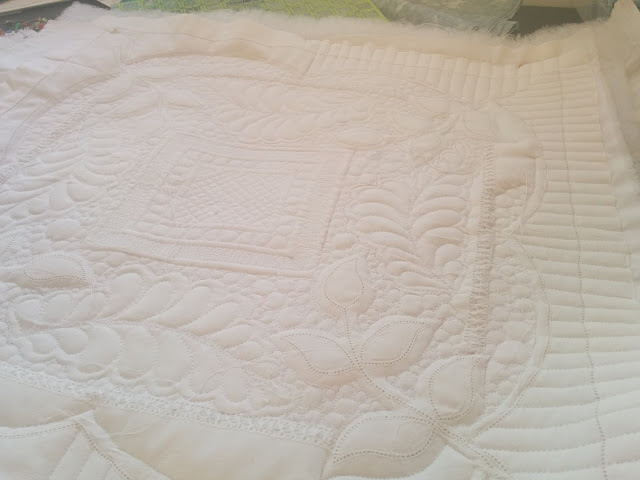 The quilting just sings! Congrats on your 100th post, and I hope you have many more! :) Thanks for sharing your projects on Main Crush Monday. Bravo pour le FMQ, très joli.